I recently lost my father, which has been quite difficult since he was only in his 60s. His death wasn’t the only thing I needed to grieve though. In 2012, he was diagnosed with ALS, a disease that kills your motor neurons and causes you to lose your physical abilities. When he died, I had already been grieving for 6 years. 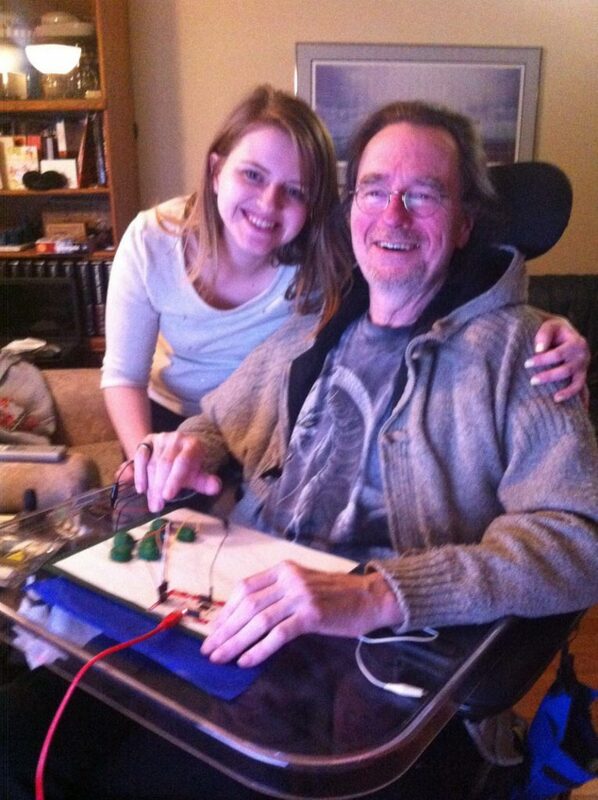 It was around the time of his diagnosis that my fondness of board games really took off. I hadn’t really connected these two life occurrences until after he died. You see, my dad loved The Settlers of Catan (as it was called back then). So much so that the last time he came to visit me, he bought me multiple expansions for the game. He wanted to try them all with me. 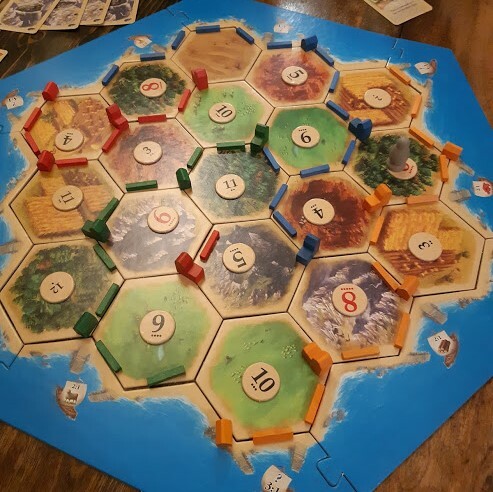 Nowadays, I mainly bring out Catan to introduce the very unfamiliar to board games, but on the night that he died I gathered some friends and we played a game. My dad was historically hilariously bad at Catan. He would always choose the absolute worst starting point that you could (I’m talking a trading post where one of your two territories is a desert), and his only goal was to have the longest road. In honour of him, we played a game where we started with the worst spots and just fought back and forth for longest road. It may sound silly, but it really helped. It felt like the appropriate way to honour him. The results of that game. Look at all those long roads, he’d be proud. As an aside, when I play board games, my goal usually isn’t to win. While that may be an outcome of me achieving my goals, it has never been my ultimate goal. I’d rather do something like go for the longest road like my dad (or more realistically sprawl in Terra Mystica). I’d like to think that I get this from him. You’d be surprised how much you can accomplish in a game of Catan with only pointing. It wasn’t only after his death that Catan helped me grieve. As his disease progressed, it became exceedingly hard to interact with him. He lost his ability to talk in 2015 so communication was slow, limited to electronic means or through pointing. You’d be surprised how much you can accomplish in a game of Catan with only pointing. One of my fondest memories from the time of his illness was playing Catan with him and the rest of my family. This required a higher level of attention than Catan would normally call for, since you had to be ready to help at the nod of a head or the raise of an eyebrow. But to me, it was worth it. On his turn, the player next to him would place the dice in his hand and he would drop them to let them roll. When he wanted to build, he was helped by one of us pointing at the tops of the cards in his hand and waiting for an indication if that was the card he wanted to use. These methods, tied in with expertly asked yes or no questions, allowed for a relatively normal game. I would have liked the opportunity to play more games like this, but as things progressed it wasn’t feasible. But board games still found a way to help us adjust to our new way of life. With his disease, visiting my parents became a lot of sitting around and waiting. Board games are great for sitting around. We could socialize near him, even if he wasn’t able to participate anymore, and that was something. Dealing with the progression of a disease like ALS requires a lot of adaptation. Board games allowed for us to adapt as a family: we found ways to spend time together when we were too tired to do anything else and needed to be able to stop and pick back up at a moment’s notice. As time went on, the pile of games at my parents’ house expanded from Catan to a small collection of euros with games like Hansa Teutonica, Broom Service, and Power Grid taking leading roles. As my family’s grief grew, so did our appetite for games. Board games allowed for me to be social, without having to engage in small talk. There are other ways that board games helped me, too. Years of mental and emotional grief are exhausting and board games allowed for me to be social, without having to engage in small talk (which is honestly terrible when you have a dying parent – everyone wants to ask how they are and the answer is always dying). With board games, I had something to think about, a goal to focus on, and a way I could comfortably interact with other people. I started participating in weekly game nights with my friends. The ritual was helpful, and the social aspect really helped stave off depression. I’ve tried videogames and TV as a distraction as well, but they were never as successful for me as trusty board games. As my hobby grew, so did my group of friends. I’ve never had problems being social, but playing board games has connected me to so many different people. I wouldn’t even know many of the friends I have today (including my fiancé) if it weren’t for games. I’m sure you can say this about any subculture, but in general the people who play board games regularly are good people. Board games gave me a support system that helped me through a very rough period of my life and I’m so thankful for that. I love board games and play them for all sorts of reasons, but one of those reasons has been to grieve. People always say that “everyone grieves differently”; and my way happened to be through games. In loving memory of John Hartin: father, husband, brother, friend, and exceptionally bad Catan strategist. Kathleen's love of board games started at a young age, and has only grown over the years. Her favourite style of games are those that involve a lot of beige, and wooden cubes. Thank you for this. I lost my mom back in October 2018 to cancer. I mourned her almost from the time I got the call that she was diagnosed, so I understand the long waiting game watching our loved ones disappear. Mom always suggested board games on rainy or snowy weekend afternoons. “Invite Christopher over and play a game”. She rarely played with us, but on occasion she did. She really loved Cribbage and Mancala (nothing too intricate), and loved seeing us on the floor with HeroQuest all set up, making a big bowl of popcorn. I am using a number of different coping mechanisms, work, working out in the gym, video games, talking with my wife, and also board games. Coming up on what would have been her 67th birthday this month she’s very much in my mind. Again, thank you for this.